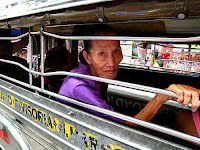 “Mamâ, Transville po!” said chubby lady as she handed over a hundred-peso bill. The driver was, in fact, already counting her change. 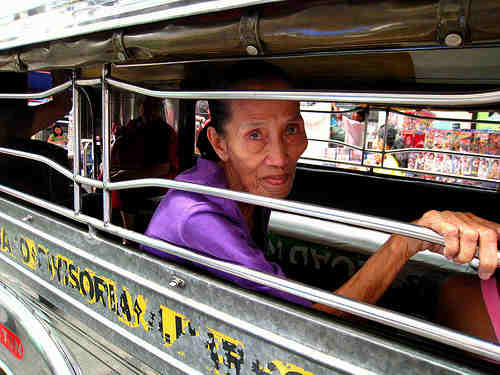 Her fare was no more than 10 pesos. When done, he handed the change to clumsy skinny boy in uniform right behind him. The latter promptly spilled a coin into a plastic basket on the jeepney’s floor that was filled with plastic bags of all sorts of things. The sympathetic long-haired man next to me called to the old lady who owned the plastic basket to tell her that a coin from chubby lady’s change had spilled into her collection of plastic bags. She promptly dug in to see where the lively coin had gone. There was no sight of it… “Walâ naman eh!” she complained. “Piso pô…” I volunteered, trying to be of help. 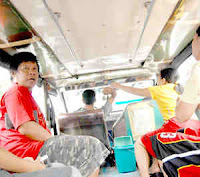 “Piso nga pô,” long-haired man agreed with me. So the old lady dug right back in, but still there was no sight of the missing coin. Ay… Long-haired man and I both managed embarrassed smiles. Five pesos pala! “Para!” chubby lady soon called out crossly. Makakatisod ang ngusô when she got off, dabog pa! It’s not, of course, as though he asked to be born with larger palms and God failed to humor him. My guess is that she will be quietly thanking Mother Luck when she gets home and finds the five peso bill inside one of the plastic bags. But to get back to chubby lady’s misfortune… Who’s to blame?